Yes, 'Drop In' class rates are available, Ideally please contact Carla beforehand if it's your first class, to 'Welcome!' you & answer any questions you may have and / or to reserve your spot, spaces are subject to availability, especially in the smaller groups. Payment can be made directly to the teacher after class. x6 Block Class Passes are at reduced price to you, rather than 'drop in' price. I'M NOT FLEXIBLE, CAN I DO YOGA? Yes certainly! Many people think that you need to be bendy & flexible to begin. Yoga (asana) posture practice is not about who can get into the most perfect pose! Come just as you are, we're all different with different degrees of flexibility & experiences. As you practice regularly, your yoga practice will help you to become more flexible, stronger & agile, with a growing overall sense of confidence & well being, both physically & mentally. I'VE AN INJURY CAN I STILL COME TO CLASS? To ensure you enjoy & get the most out of your class 'safely', it's important you advise Carla prior to class of any previous, current or new injuries & any conditions she should know about (ideally via email or phone prior to attending class if 'significant'). It's always advisable if in any doubt to seek professional medical advice from a qualified GP / Doctor prior to taking on any form of physical activity. I THINK OR I AM PREGNANT CAN I STILL COME TO CLASS? 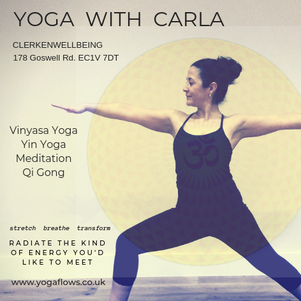 Please let Carla know if you are pregnant or think you may be prior to the class (ideally via email or phone prior to class). It's important to keep you and baby safe during your pregnancy. If you are new to Yoga, ideally it's recommended not to practice at least until after your first trimester. Attendance will be discussed on a case by case basis. You'll start to experience the many benefits of yoga even if you only begin with 1 hour a week. If you can do more than that, you'll certainly experience even 'more' of the benefits. Suggest starting with 2 or 3 times a week for 1 hour or 1 and half each time. And if you can only manage 20 mins per session that's fine too! Don't let time constraints or unrealistic goals be an obstacle, do what you can & don't worry about it. You will likely find that after awhile your desire to practice expands naturally & you will find yourself doing more & more. You don't need to wear any specific labelled yoga wear. Definitely wear something that is comfortable for you, (e.g. leggings or shorts, T shirt that's not too baggy, vest top etc...)or any other sports tops of bottoms you may already have, as long as it allows you to breathe & move freely. Practice is done bare foot. Some people also like to bring a small towel to class when things get good & sweaty! It's recommended to buy your own mat, not only does it encourage commitment but also allows you to start to develop your own home practice too. WHY ARE YOU NOT SUPPOSED TO EAT 2 TO 3 HOURS PRIOR TO A YOGA CLASS? In Yoga asana (posture) practice, we do allot of movements, twists & bends. If you're not fully digested from your last meal, your practice & body will be uncomfortable, feel sluggish & your mind focused elsewhere. If you do feel you need a light snack prior to class, try yogurt, a few nuts or juice, 30 mins to an hour prior to class. Food or drinks (water) should 'not' be taken during practice for the same reasons. OM is a mantra, or vibration, that is traditionally chanted at the beginning & end of yoga sessions, (spelt, pronounced 'AUM'). It's the sound of the Universe that connects us to & pulsates in all things. When chanting OM we begin to sense a bigger connection to all that surrounds us, & it's chanted vibrations uplifts, centres, balances & soothes. Yoga is not a religion. It is a practice & a science that began in India an estimated 5,000 years ago. The father of classical Ashtanga yoga, the Sage Patanjali,(not to be confused with Sri K. Pattabhi Jois' Ashtanga Vinyasa yoga), wrote the Yoga Sutra (i.e.the Eight-Limbed path). These scriptures provide a framework for spiritual growth & mastery over the physical & mental body. Some classes may interweave philosophies such as Hinduism or Buddism but there's no requirement to believe or follow them. You also don't have to surrender your own religion either or follow a religion. The practice of Yoga is open to all peoples, classes & all faiths. You may simply follow the yogic path & experience the results & benefits yourself. Please arrive a little earlier to class so as to 'settle & arrive' ready for your Yoga practice or if you'd like to ask the teacher anything. Please turn off all mobile phones & refrain from loud conversations at the start of class, respecting others who may be in quiet meditation prior their practice. Please do not bring drink or eat any food or water while in class & during practice. If you arrive later than 5 mins into class you may be refused to join, as a safety precaution for you in not having warmed up & as respect to others in not disrupting the flow of class OR if allowed, please ensure you complete 3 rounds of Sun Salutation A & 2 rounds of Sun Salutation B prior to joining the rest of the class. If you have to leave class early, please advise the teacher prior & very important you practice a minimum 5 mins 'Savasana' / Corpse pose at the end of your class before leaving class.